I always knew It would be someone like you. I have decided that all is over between us. Oliver crumbles, his world shattered. This opening scene of Hal Roach’s 1931 comedy film Beau Hunks has so much to offer those interested in the field of psychoanalysis, invoking indeed evoking the unconscious, that one is spoilt for choice as regards a place to start. 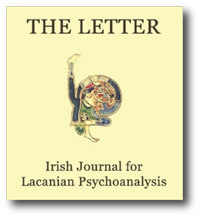 This would be reason enough to use it as the opening scene for this issue of THE LETTER, which is given over to the bulk of the contributions to the 1999 November Congress of the Association for Psychoanalysis and Psychotherapy in Ireland, which took Lacan’s 1967-68 Seminar on The Psychoanalytic Act as its pivot. Even if it were not the case that in the attempt to convey something of the essence of human subjectivity’, the comic double-act has surely more to recommend it than the Pavlovian circus act, it would still remain that along the route towards trying to isolate what was distinctive about and constitutive of the Psychoanalytic Act Lacan pauses over the act of stupidity, privileging the act of pure stupidity to be more precise. If, in addition, we pause to consider the stupidity essential to the success of the above scenario we find the unconscious to be a writing whose letters are there to be read and the subject, misplacing his eyeglasses and therefore blinded to his own message, assuming that the one who is reading knows, understands, empathises with the position that the one to whom the letter is addressed is placed in, – whereas the reader is above all else acting without thinking. The paradox being, – and the attention paid to Lacan’s seminar over this past year and the consequent contributions to the annual congress contained here bear witness to this, – the incredible amount of thought entailed in attempting to convey some sense of this position, of déconnaissance as opposed to méconnaisance. In the comedy which follows on the méconnaissance of the first scene, Oliver, – his ‘one-time Sweetheart’ transformed into ‘a vampire’, ‘Wrecker of men’s happiness’, – sets off with the hapless Stanley for a place ‘where we can forget’. Do they arrive at the analyst’s door? As is often the case the alleged enormity of that step makes for alternatives and so instead, the next scene finds them walking through the massive gates of a desert fort. They have joined the Foreign Legion. There Oliver discovers that, – far from it being the case that there is a singularity to his loss, to his misery, – each of the other legionnaires wears next to his heart the very same picture of the very same Woman, – ‘Wrecker of men’s lives’, ‘Loved by everyone‘.